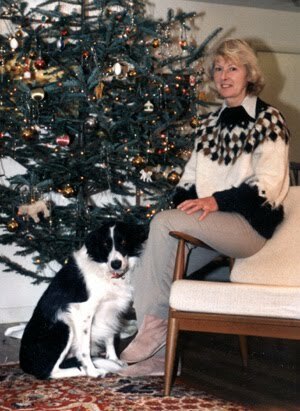 Anne Patricia Mellor passed away on September 22nd, 1999, after an unexpected heart attack brought on by complications from cancer treatment. She is sorely missed by all of us. It was an extraordinary moment in an extraordinary place. I was with the family and friends of a parishioner about to be taken off the respirator in the Coronary Care Unit. Their mother and friend was very sick, gracefully looking cancer in the eye and struggling to put an unexpected heart attack behind her. She had been in a coma for more than 24 hours. She did not know how sick she really was. On the other hand, she was not the kind of woman to do anything but fight. As the sedation gradually wore off, she opened her eyes and immediately recognized her children. She did not speak but simply nodded her head up and down, side to side in answer to the doctor's questions. At that point, with everything to live for in that room, the doctor asked her, were she to have trouble in the next fifteen minutes, would she want to be put back on the breathing machine. She paused for what seemed like an eternity, and with all her conscious powers, she nodded her head yes. About fifteen minutes later, she lay breathing freely and without pain. Her children stepped out of the room to be briefed by their doctor on the seriousness of her condition. Straining to turn toward me, fixing me in her gaze, she spoke for the first time for days: "Am I going to die?" Now it was my turn to pause. I replied: "I don't know. All I know is that you are very sick. You have some time now to be with your family and friends and give them what you've always given them. Your love." Not a half hour later, the doctor compassionately and clearly explained her condition to her. She had some more information now. When asked again the question of extreme measure, of whether she would like to be put back on the respirator, or to receive infusions, or even antibiotics, to each one she resolutely and peacefully shook her head no. Then we gathered around and celebrated a communion the like of which I have never celebrated. We were preparing, all of us, for a journey into the arms of God. Our good friend was taking us there and inspiring us to look with her eyes into the promise of that great mystery. How would you answer her question? "Am I going to die?" I've thought about every day since, and I realize it might as well be this question: "Am I going to live?!" In the past few weeks we have had a baptism and a burial that have moved me very deeply. In each we gathered as Christ's body to pursue his calling in righteousness and faith. Before each I was blessed to be with two families and their friends, who in every way expressed godliness, endurance, gentleness and so much love. These good folks were eager and passionate to take hold of eternal life as its promises presented themselves at the beginning and the end of this life. All of us then, those coming from far and near, those just passing through and passing by, truly made the good confession in the presence of many witnesses. Paul says this is fighting the good fight of the faith. It is also coming to terms with life and what it means to us. Once again we have arrived at this busy and exciting time of year, when life overflows with so much activity and thanksgiving. The church is burgeoning and full. Our programs are reaching to more and more. Our life is unimaginably rich and full. And yet we yearn to lay hold of the life that really is life. In the next few weeks you will be hearing some sermons around this theme that we hope will be pivotal for the life of our congregation. My prayer is that we will all come away with a deep appreciation for the richness of our life here and how important it is for us to fore on, to fight on, to do what God is calling us to do. And that each one of us will answer the question of dying and living as the Lord intends. Lay hold, friends. For here is life indeed. Howe Library lost one of its most talented and generous friends with the recent death of Anne Mellor. For nearly a quarter of a century, her charming sketches and calligraphy brightened announcements of speakers' programs, workshops, book discussions, and story times at the Library. In honor of Anne, the Howe Library Corporation passed a resolution to express its deep debt for her dedication and the beautiful legacy of her work. During November, Anne's spirit was very much alive in the Mayer and Murray Rooms, where many of her pieces were on exhibit.